I love my birthday. Because Birthday Dinner. For my 26th this past Thursday, my lovely boyfriend made us reservations at Butcher and the Rye, downtown, a restaurant I have been anxiously awaiting to try. If you have heard of Butcher and the Rye, you probably also know how far in advance you have to make reservations (unless you like eating dinner at the ungodly hour of NINE!). Tim used OpenTable on August 16th, to make reservations for September 18th!! And he said that when he searched the date, the only slots available were 7:00 and 9:00. Being the early birds that we are, Tim obviously snagged the 7. It was meant to be. He told me that he had wanted it to be a surprise, but knew how much I would love to look forward to it. (This guy knows me). And just like he suspected, after a month of anticipation, we got to this awesome new restaurant around 6, took a seat at the bar for a pre-dinner drink.. and our experience matched my anticipation, ten-fold. This place is just cool. I’m not even sure where to begin with the interior. 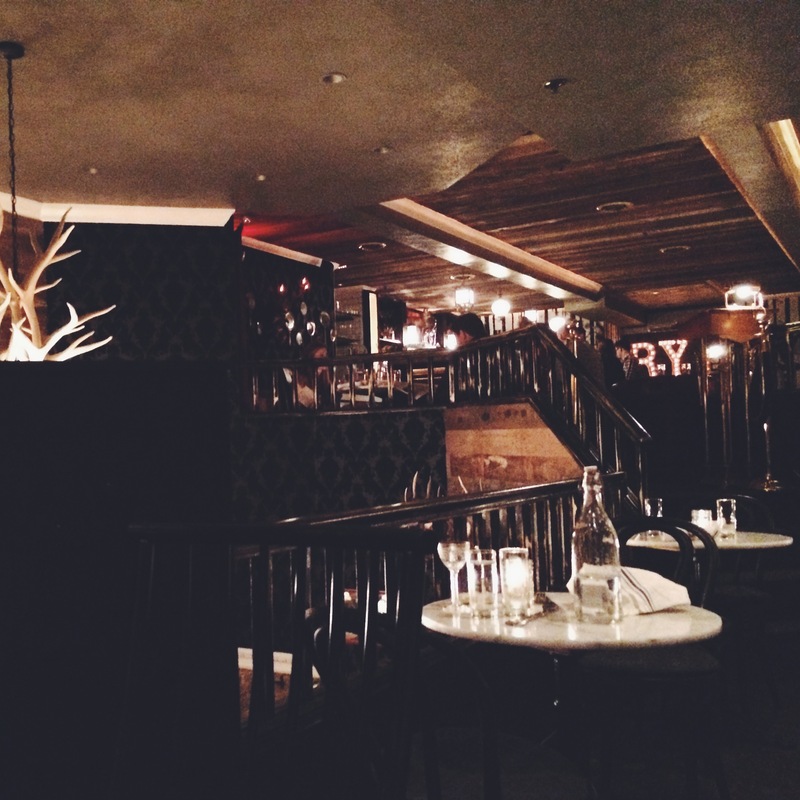 I’ll start with the bar – cozy, intimate, perfect. It’s like that quote from Great Gatsby about larger parties feeling more intimate, because you have more privacy. The space itself isn’t super large, but the room has a large vibe, creating a cozy, romantic feel. It’s dimly lit, the ceilings are high, there is a gorgeous whiskey bourbon collection boasting over 350 different varieties towering above the bar, complete with wooden ladder for easy bottle retrieving. The ambiance is beautifully executed. There are books in nooks and crannies, taxidermy, antlers, paintings, lights. It just opened in 2013, but seriously feels like its been there hundreds of years. It’s just beautiful. Continuing on this love fest, we were politely and immediately greeted by Ryan, the bartender. My first drink of the night was my go-to The Bees Knees ($10): Beefeater Gin, Lemon, Spiced Honey. Perfection. I’ve certainly had variations of this cocktail at lots of restaurants in my day, and this was by far the best. No frills, just a damn good drink. Next, I wanted to try a whiskey cocktail, and given my somewhat unsuccessful past with attempting to order drinks I’ll like.. I asked Ryan for a recommendation. I basically only told him I didn’t like overly sweet things – and I was up for a surprise. He served me a Whiskey Daisy (not on the menu). I have no idea what was in it. All I can tell you is that it was strong, lemony, and truly delicious. I highly recommend just asking for this drink. Enjoy the unknown!! Halfway through this bangin’ cocktail, the clock struck 7 and we were led to our table up a beautiful flight of stairs, to the second, of three, floors. The row of 2-tops where we were seated were a bit too close for my comfort.. but the ambiance really does make up for it. We were quickly greeted by our server for the night, Christina. She was so friendly, helpful, really on top of things, yet relaxed and casual. I obviously already looked up the menu a dozen times in the past month, and already knew what I wanted to order. For starts, we went with the Brussels ($8): Brown Butter, Dill, Parmigiano Reggiano, Preserved Lemon Aioli, and the Pig Candy ($8): Pork Belly, Apple Kim Chi, Miso Caramel, Cilantro. OMG. I WILL START WITH THE BRUSSELS. FIrst off, he acted excited, but I could feel Tim’s fear when I wanted to go with brussel sprouts. Understandably so. These delightful little cabbages don’t have the best reputation. But I had a good feel about this one. And I was right. Tim’s first reaction: “ARE THESE VEGETABLES?” They were that good. Browned, rich and buttery, flaky, citrusy, cheesy…… out of this world. They just felt good to eat. 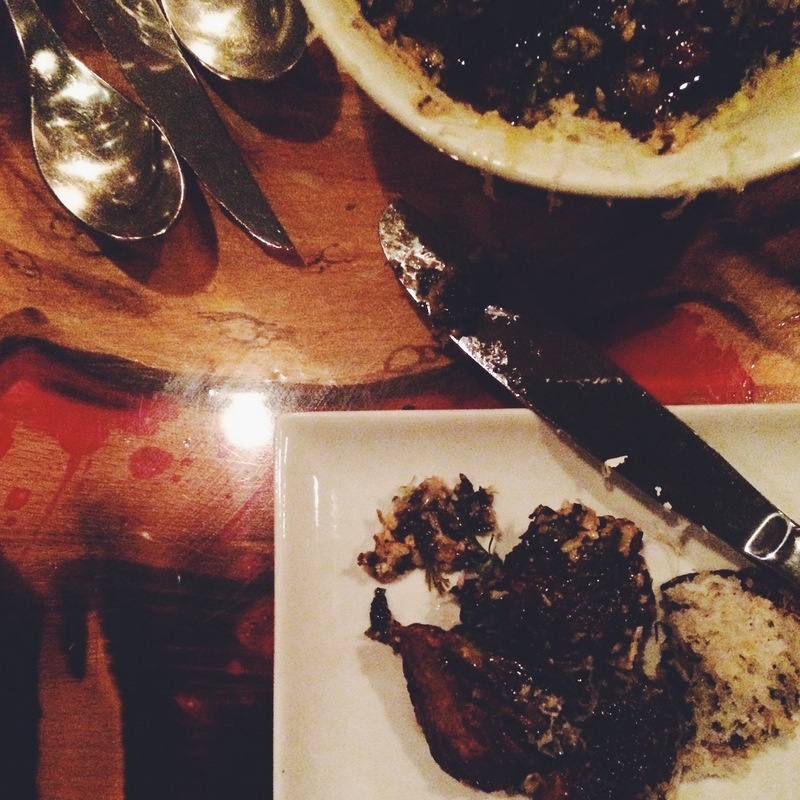 Truly unlike anything I’ve ever had, and we can’t wait to go back for more. After a tough personal struggle to leave some brussels behind so we still had room for the rest of our food, we moved on to the Pig Candy. Also incredibly delicious. 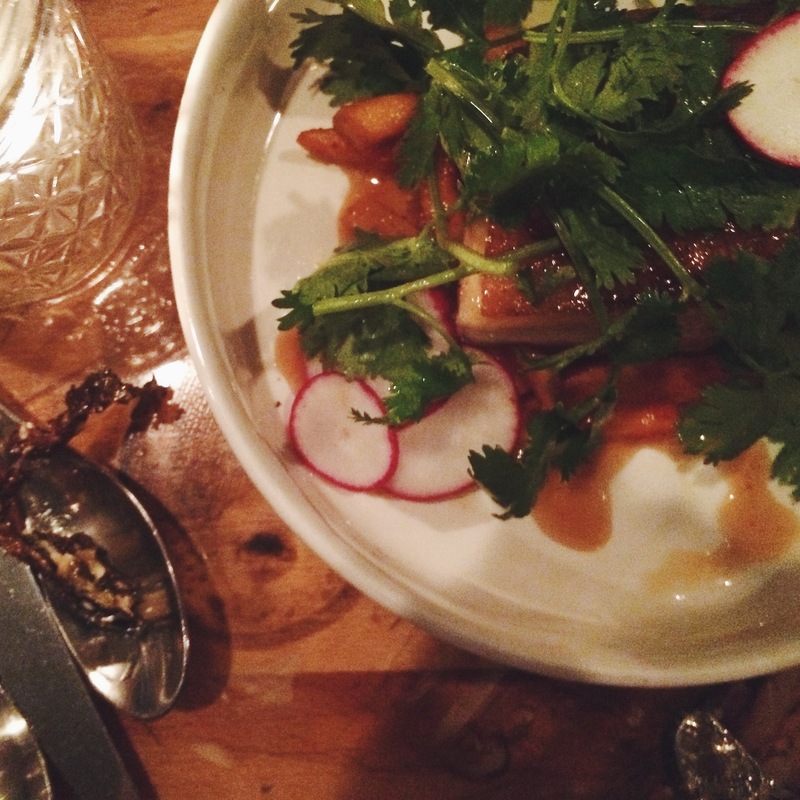 The pork belly was fatty and salty and delicious and everything you want pork belly to be. The acidity of the Apple Kim Chi cut the richness perfectly and added a nice crunch, and the cilantro was a lovely pop of freshness. Just outstanding. Next, the main courses! (Noteworthy: I’d also like to add that the pace at which our dinner was served was perfect. I always hate when I look forward to a meal for so long, and then it’s over before I know it. These courses were perfectly timed.) Like we normally do, we chose 2 entrees to split. 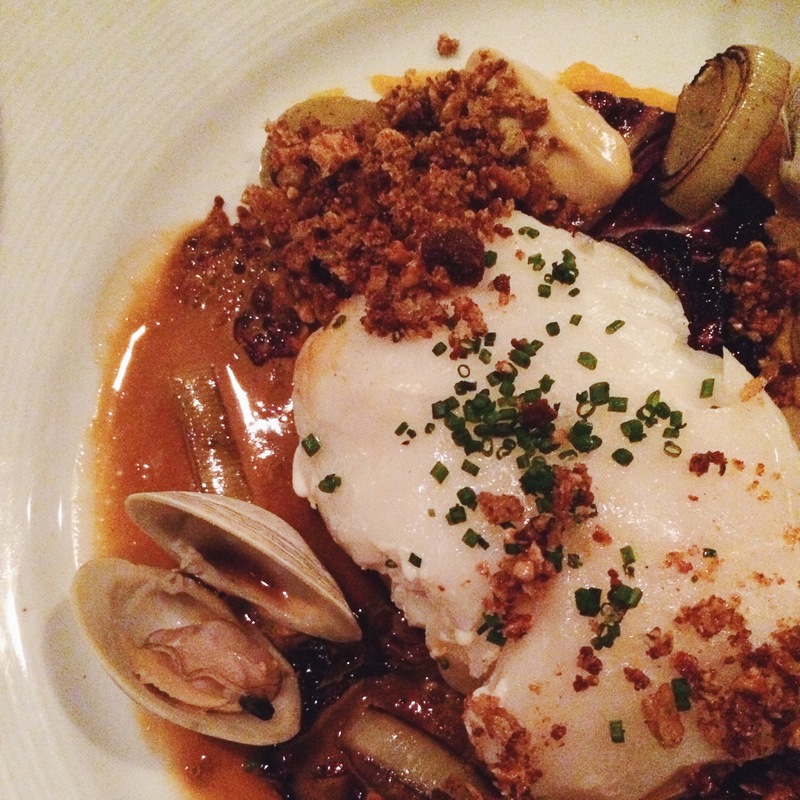 We went with the Dirty Pasta ($16): Ground Duck, Strozzapretti, Sage, Brandy, Pecorni Romano, and the Halibut Confit ($28): Sweet Potato, Shellfish Emulsion, Leeks, Raddichio, Littleneck Clams, Hazelnuts, Espresso Brown Butter. I’ll start with the Dirty Pasta. I NEED to start with the DIRTY PASTA!!! This was.. unbelievably delicious. It sounds so simple. But the flavor is anything but. My sister came here over the summer, and said this dish was one of the best things she had ever eaten. And I seriously have to agree. I have never had this type of pasta before, Strozzapretti. 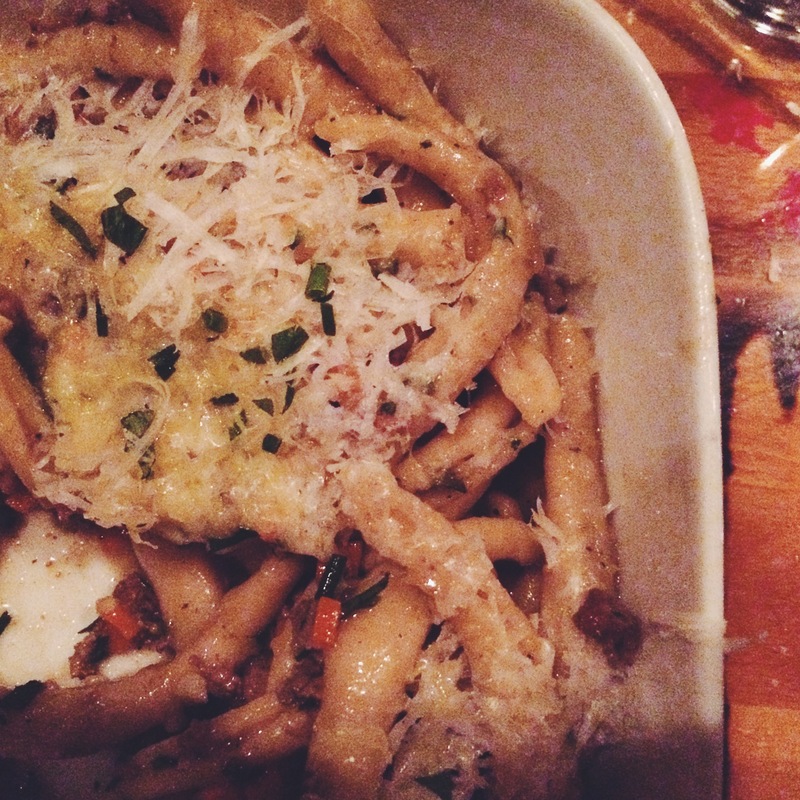 But after some research I found that it is an elongated, hand-rolled variation of Cavatelli. It was so tender and delicious. Each bite was a huge pop of salty deliciousness, accented by the sage . And, to my surprise, because even though this pasta didn’t taste especially peppery, the aftertaste was SO DELICIOUSLY PEPPERY. It was like a rollercoaster for my palate. One that I never ever wanted to stop riding. The ground duck was succulent and flavorful.. and every bite was cheesy and satisfying. 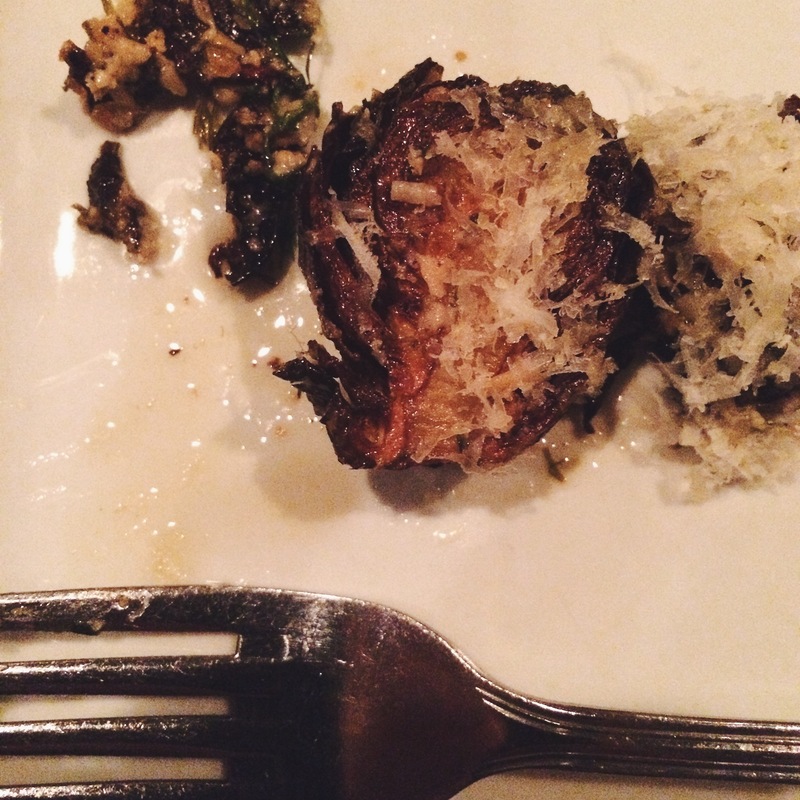 It was probably one of the most comforting dishes I’ve ever eaten at a restaurant. Growing up, we ate ALOT of Hamburger Helper. Our personal favorite was their Stroganoff. It was literally just ground beef, spiral noodles and some cream sauce powder mix. It was one of my favorite childhood meals. Eating this pasta felt like eating Hamburger Helper Stroganoff on ecstasy x100000000. I actually haven’t stopped thinking about it since I ate it. 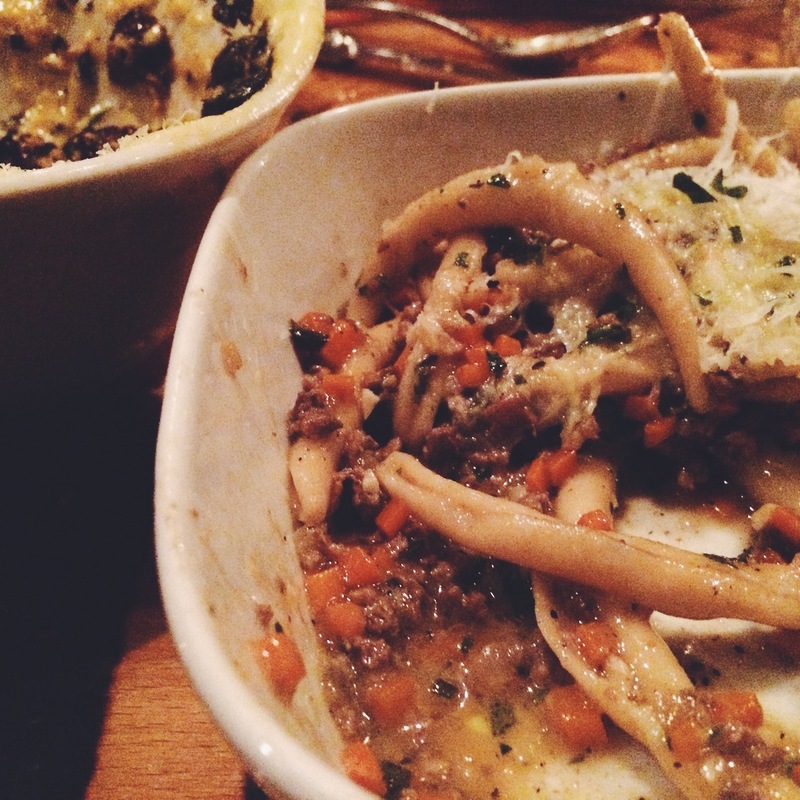 Do yourself a favor and book a reservation just to try the Dirty Pasta. On to this freakin Halibut Confit. AMAZING.The texture and flavor of this fish was truly astonishing. The halibut was so light and buttery. And it tasted as though it had been lightly, subtly infused with salt and flavor. Every bite was so consistent and wonderful. And although every other component on this dish was surprising and interesting, it COMPLETELY made sense with each bite. The crunchy hazelnuts played perfectly with the smooth fish. The sweet potato was rich and creamy, the leeks were succulent, and the clams and selfish emulsion added a briny freshness that made absolute perfect sense. Just brilliant. After basically licking both of our plates clean, it was time for dessert. And also, one final drink. HAPPY BIRTHDAY TO ME. 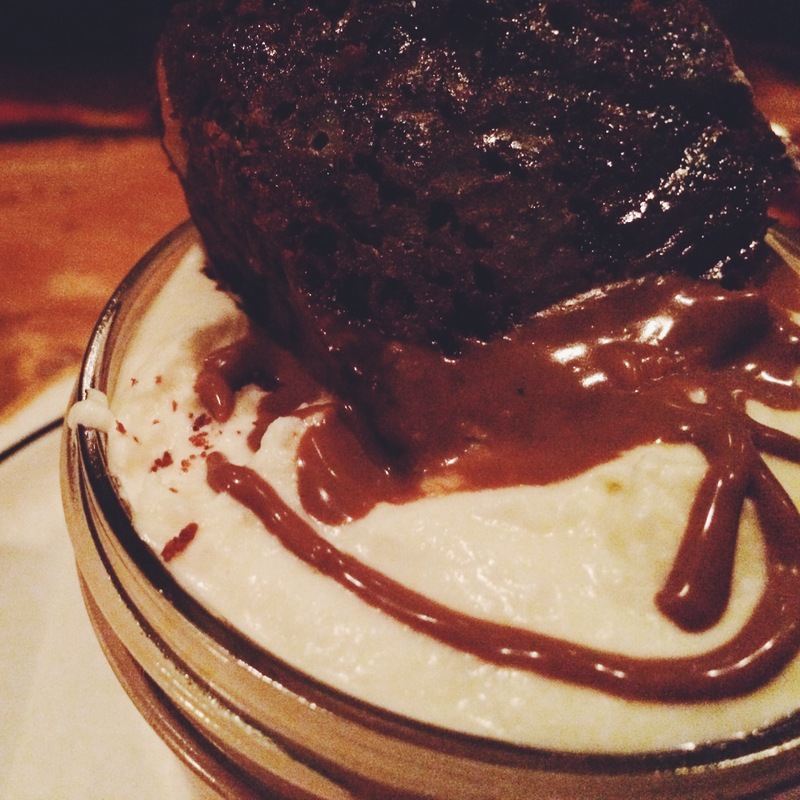 We had a hard time deciding, so we went with our server’s passionate recommendation of the Pot De Creme ($8). The preparation of this changes frequently, and tonight it was chocolate cream with a brownie. 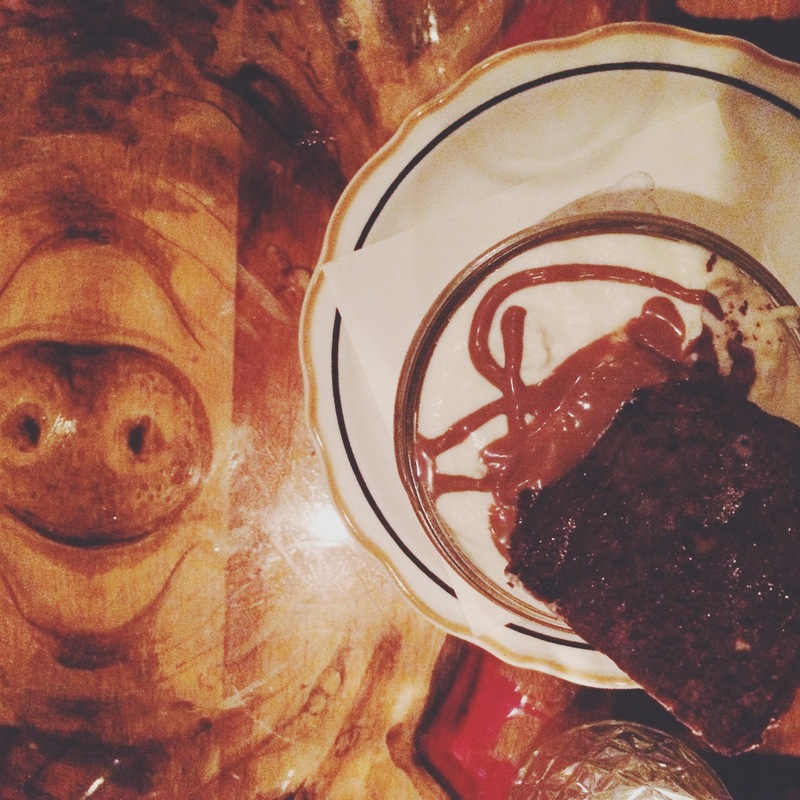 It was rich and smooth, and the brownie was nutty and sweet. And my final cocktail, was the classic Manhattan ($10): Buffalo Trace Bourbon, Cocchi Torino, Angostura. If you’re wondering, no, I had no idea what any of those words meant. But I was feeling risky!! 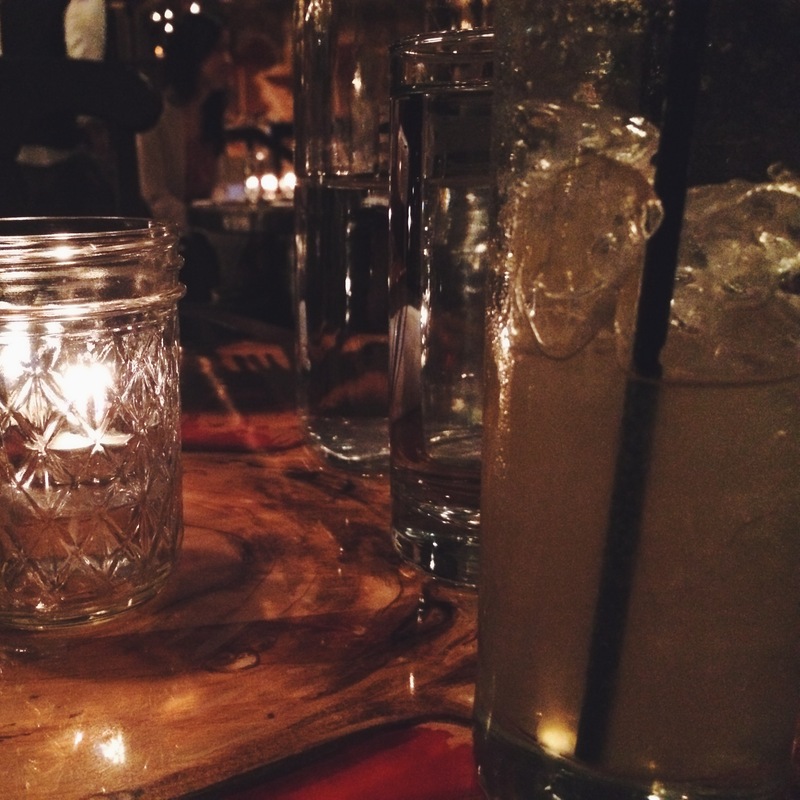 And wow – this drink was a great surprise, and a perfect end to the meal. It was strong, complex in flavor and tasty. Upon doing my research, I found that Cocchi Torino is a vermouth, characterized by orange peel, vanilla and caramel. And Angostura is a concentrated bitters, infused with herbs and spices. I was glad I took the risk. I will DEFINITELY be ordering this again. Wow. Writing this post only made me want to go back as soon as I can. Our trip to Butcher and the Rye was a romantic evening full of new flavors and experiences; I feel like I learned so much! It was truly wonderful. I really am currently looking through my calendar in attempts to find another reason to book a reservation. I think there’s a random Tuesday in October that could use a celebration! This place DEFINITELY requires reservations. I’m not sure how much busy times fluctuate – but plan this food stop in advance. 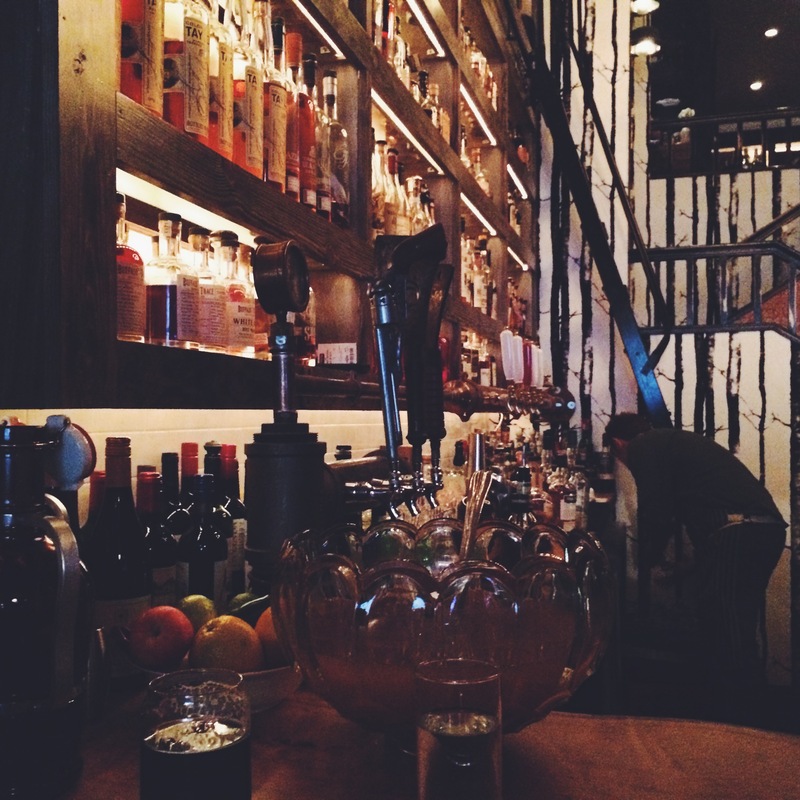 Get to your reservation early and spend a little time at this bar. Ask for a recommendation, enjoy the atmosphere. PLEASE ORDER THE DIRTY PASTA. I saw some larger tables scattered throughout the restaurant that looked like they’d be awesome for bigger groups. Explore all categories on the menu. Their small plates are truly epic. 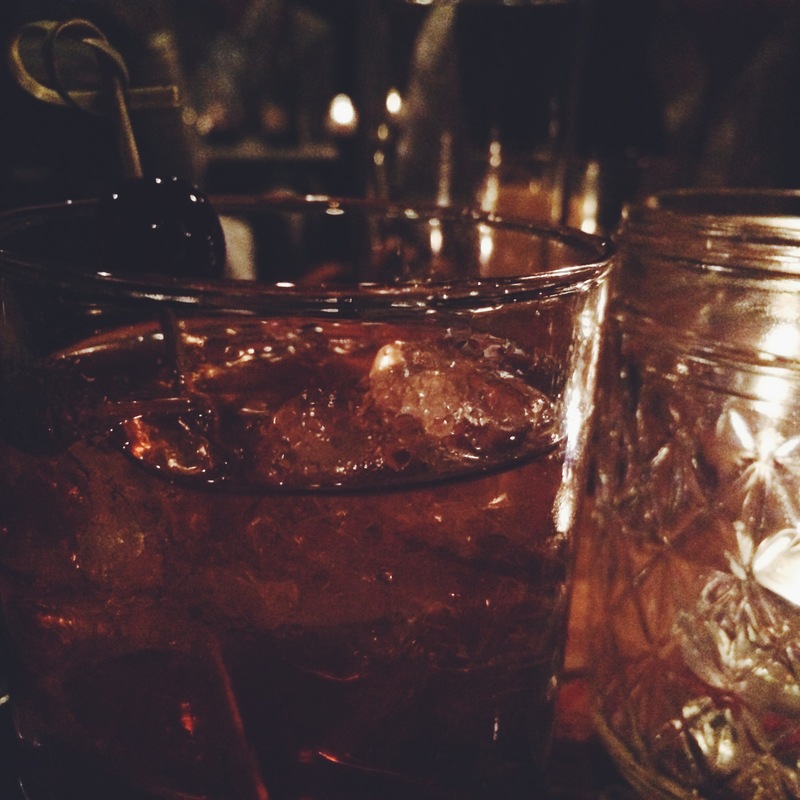 I really can’t wait to go back to Butcher and the Rye. I want more food, more drinks, and more atmosphere. It was an absolutely perfect place to spend my birthday with my boyfriend, and I highly recommend checking it out.